This year’s festival workshop program includes opportunities for all skills levels. You can learn how to forge your own spoon or advance your scrolling technique under the tuition of a scrolling pro. We are hosting a special workshop for women interested in trying blacksmithing for the first time and bladesmith Shawn McIntyre will take a class through the process of creating their own hand-forged knife. For working practioners we have created an opportunity to team up and work collaboratively under the guidance of experienced artist blacksmiths to forge a sculpture designed by Canada’s renowned blacksmith, Jake James. Let Master Bladesmith Shawn McIntyre take you on a journey into the art of bladesmithing and guide you in the design, forging and creation of your own simple and elegant blacksmith’s knife. Shawn will teach this workshop with the assistance of our familiar Waterside crew. Basic skills in blacksmithing are required and previous experience in metal workshop practices are highly recommended for those wishing to undertake this course. Take your beginners skills to the next level with this workshop focussing on the many different tools and techniques to add texture and surface finishes to your work. Students will work on a set of course examples with plenty of room to experiment. Why not join us for a day of fun and take home several unique pieces? For this workshop participants will need to have some skills in basic blacksmithing and be familiar with using a coke forge. We are excited to announce a special course in scroll making by none other than the scroll meister himself, Simon Pankhurst. In a first time festival exclusive, Simon has offered to come down from his forge in Bright and share with us the tips and tricks on how to make some of the most intricate scrollwork currently produced in Australia. This half-day workshop will start off with some theory on scroll making followed by an overview of the tips, tricks and tools Simon uses in his daily practice. Simon will work through where things go wrong with scrolling and what you need to do to obtain symmetry and tension in your finished pieces. Basic blacksmithing skills and familiarity with working with a coke forge required. What object has a greater sense of history than the humble spoon? 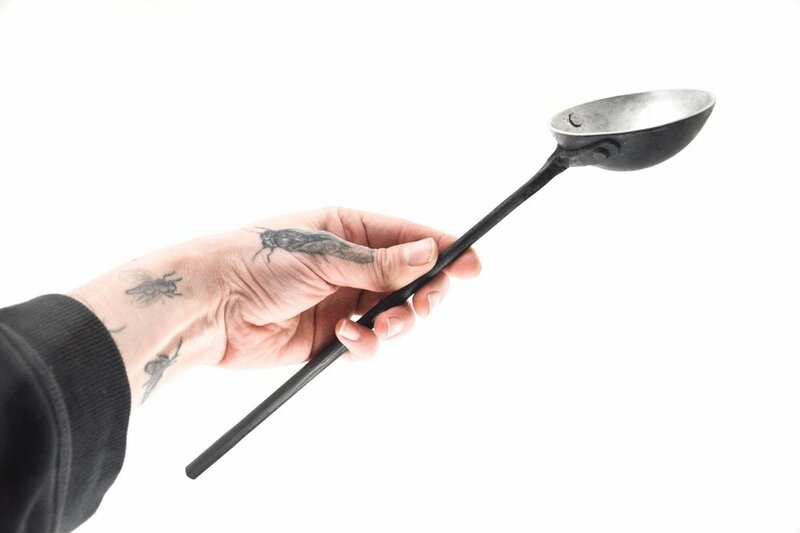 Every hand forged spoon is as unique as its maker and tells a story about time and place as it enriches experiences and conversations around shared tables. Visiting from the US, Elizabeth Belz will demonstrate the basic techniques involved in forging a spoon from steel. Depending on each participants skill set they will be able to embellish the spoon as they see fit and food safe finishing options will be discussed. This workshop is intended for individuals who have basic forging experience and knowledge of controlling a coke forge. Jake will be leading a collaborative sculptural project at this years Blacksmiths Festival. The sculpture: “Many Hands” is based on themes of migration and native flora, and will be permanently mounted on the Waterside Metal Art Studio forge at the Festival site to become part of the public art landscape along the Maribyrnong River. Participants will work as part of three teams of three blacksmiths, with Australia’s own Ben Beams, Pete Mattila and Will Maguire as forging team leaders. This will be a unique experience, working alongside some of the most exciting smiths in the country, each team completing elements of the sculpture that will come together as one piece at the end of the event. Participants in the masterclass will be involved in planning and preparation on Thursday 25 April and forge as part of the team commencing on Friday 26 April and over the two public days of the festival (27-28 April). This one-day workshop will provide an overview of the practice: primary tools, safety precautions, creative possibilities and most importantly a hands-on practical experience in moving metal. Participants will learn that blacksmithing isn’t about brute strength, it requires finesse and patience to accurately shape steel. Learning to manage a coke fired forge, students will focus on the fundamental techniques involved in traditional blacksmithing: tapering, twisting, shouldering, punching, riveting and scrolling. Upon completion of the course, students will leave with one or two forged coat hooks (depending on interest and time) which can be mounted to a wall. This workshop is intended only for individuals who identify as women, who have little to no experience working with steel and fire. Elizabeth Belz is a metal artist from Stillwater, MN, USA. She was a craft education intern at North House Folk School, Grand Marais, MN, in 2016, where she assisted the school in re-establishing its blacksmithing shop. She was the resident sculpture artist with the Science Museum of Minnesota, St. Paul, MN, in 2017 and has won numerous grants to aid in the production and development of her work. She has studied at the Minneapolis College of Art and Design, Minneapolis, MN; Penland school of Craft, Bakersville, NC; and John C. Campbell folk school, Brasstown, NC. Currently she is one of two blacksmiths apprentices at the National Ornamental metal museum in Memphis, TN (2018-2020). Elizabeth explains ‘while she was learning a diverse set of traditional and contemporary techniques, shaping and moulding both utilitarian and sculptural forms, one thing remained consistent: steel’. The exploration of that material through numerous avenues of thought has manifested itself within her current body of work. Her work explores the interaction between people and their given environments. Through the use of steel, an often utilitarian but equally refined material, Elizabeth creates new perspectives and moments of curiosity in the mundane or constant barrage of stimuli we navigate daily.